We happened upon Constantin Gherasim one Sunday morning at the neighbourhood market in Alexandru, one of several municipal open markets. A Romanian Orthodox Byzantine chant, from the towers of a newly built local church, drifted over the marketplace as he told us about his choice of purchase and why he shops there. 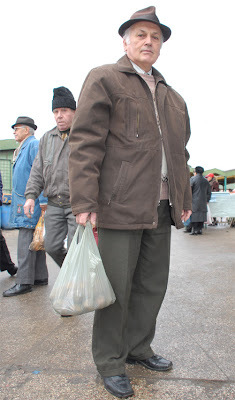 He’d bought potatoes at 1RON per kg (about 25p) and impressed upon us his preference for the Romanian cartofi that filled his bag. He believes them to be ‘healthier, more natural’ than those imported from countries abroad, like Turkey. Alexandru Market, like its counterparts elsewhere in the city – Nicolina, Tatarasi, and Halle Central – has existed since the communist-era. 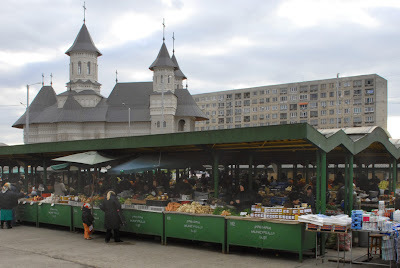 These are Iaşi’s traditional marketplaces based on a local agricultural economy, and currently offering low-cost seasonal fruits and vegetables, fresh meat and dairy products, fish, and other local produce. We sampled herbs and mushrooms handpicked from the forest, fields or roadside; raw and freshly-pickled vegetables from 50 litre barrels; sheep cheese, cow cheese, milk, meat, honey and nuts; a majority of which came direct from the producer. 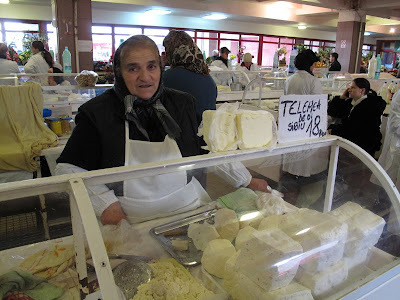 A cheese farmer, like Samica Gangal here at Halle Centrale, would perhaps make 1,200kg of cheese every summer at her countryside farm before selling it in Iaşi for 18 RON per kg. The growth of Iaşi’s Fast Moving Consumer Goods sector (Supermarkets) has impacted the marketplaces’ popularity over the last couple of years. Despite this, many people we spoke with echoed Constantin’s loyality to the markets, preferring the natural produce, which basically translates as organic. Constantin also thinks people ought to buy from there to encourage local production. “Why import when we have perfectly good or better products of our own”. To this end, he intends to start an organic honey farm and sell his produce at the market. He was amongst the 60-70 customers we interviewed at the municipal markets (plus a similar number at supermarkets) to develop a publication called Cumpărături Alese, or Hand-Picked. It’s a (supermarket style) brochure comparing the motivation behind people’s choice at the markets and the supermarkets.